Hi Friends!! I hope you are having a wonderful week!!! I have been super busy! 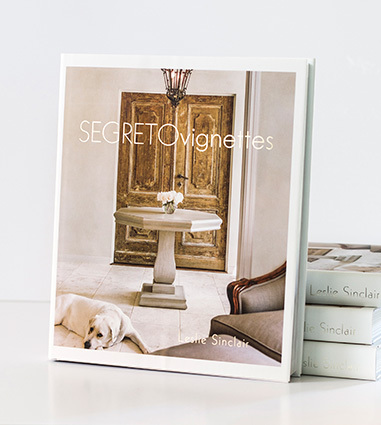 Having so much fun doing photo shoots of homes for the book and working with some wonderful people to make their homes as wonderful as they are!! London Penthouse is the theme in this space. 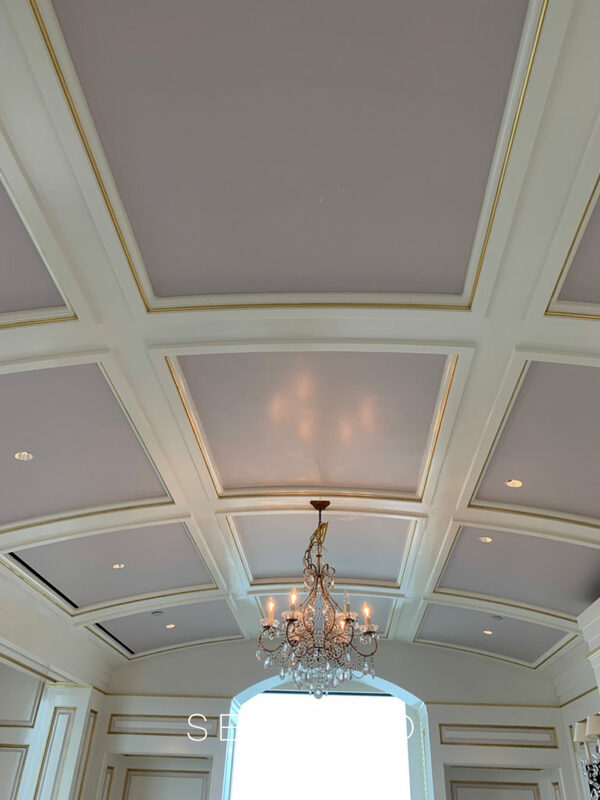 This neutral paint color with a hint of lavender is absolutely beautiful painted on the inset flat panels of the ceiling and then washed into the reveals on the wall paneling. 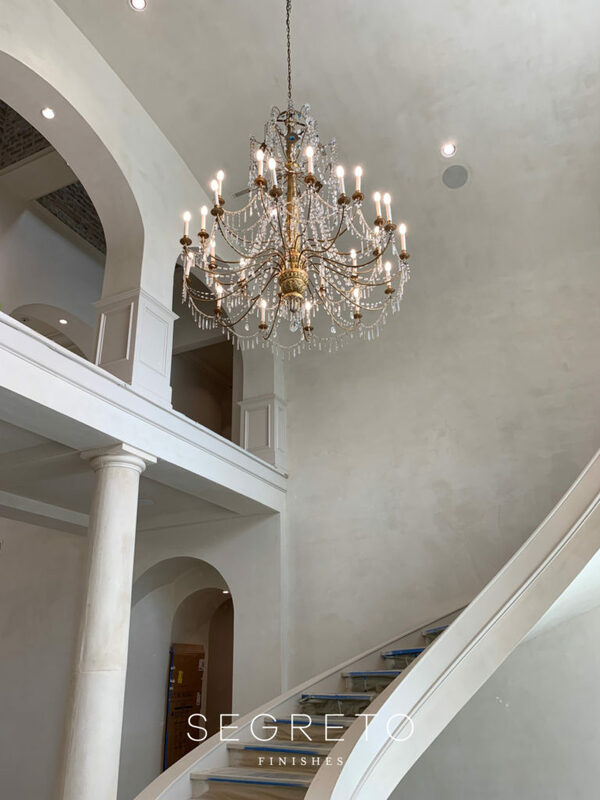 The gold leaf accents on all the bead details really make this a stand out space. 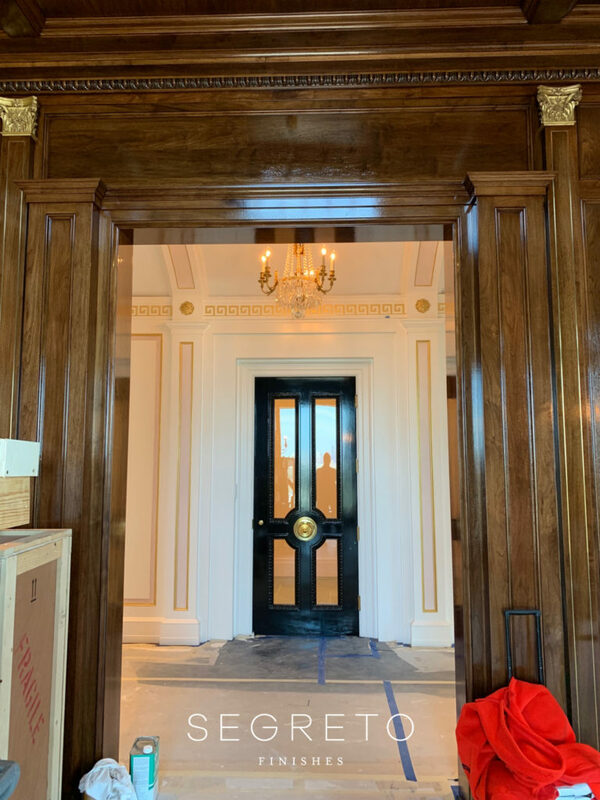 I am so excited about seeing this room completed. 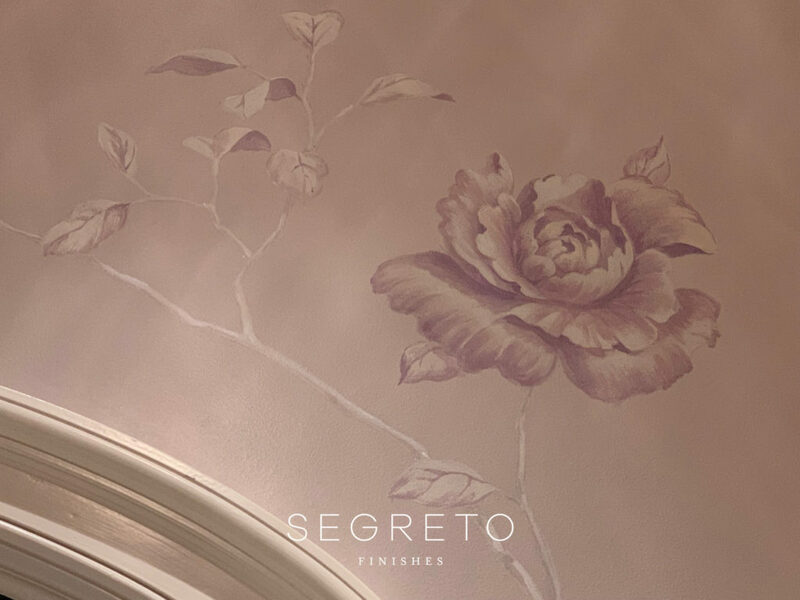 We are hand-painting a mural in this client’s office with soft rose tone on tone florals and trees. Another room got a similar treatment!! This vestibule borders a vibrant green bar and a hot pink tiled powder. 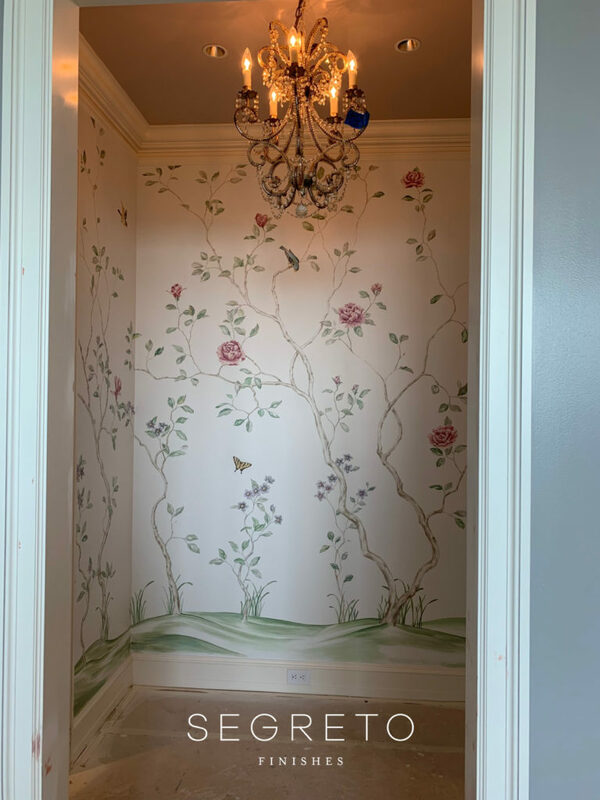 By hand painting the tree and floral design, we were able to naturally incorporate both colors to tie the two spaces together. You can tell it is still a construction site. I am standing in the study and looking toward the entry. We finished the corbels in the study to read like the brass insets inlaid into the wood. 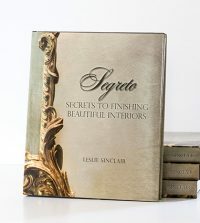 The entrance with tones of barely blue, and hints of blush embellished in gold is stunning with the high gloss back door. Imagine when the paper is removed and you see the beautiful flooring! This staircase had a few firsts for me. Notice the garland detail? This was made from a 3-D rendering that the Architect, Dillon Kyle drew out. Then they put the drawing into a machine and a perfect scale embellishment was created out of resin (I think!). 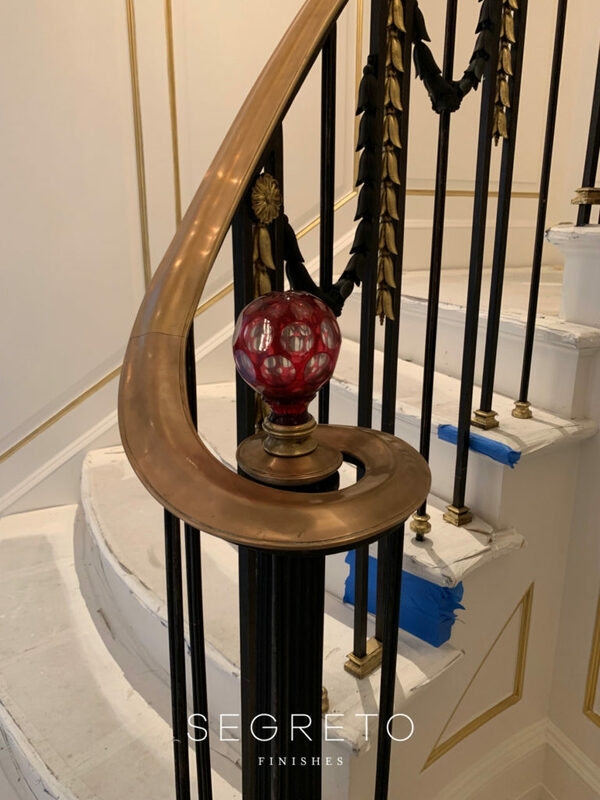 We applied gold leaf it so that they blend perfectly with the brass railings. I still want to take a field trip to see his machine! So cool! This crystal ball finial is pretty spectacular too!! Believe it our not we tried to photograph some of this house. I will see if shooting around the paper, plastic and scaffolds worked!! Look who greeted us at the next home we went to photograph!! 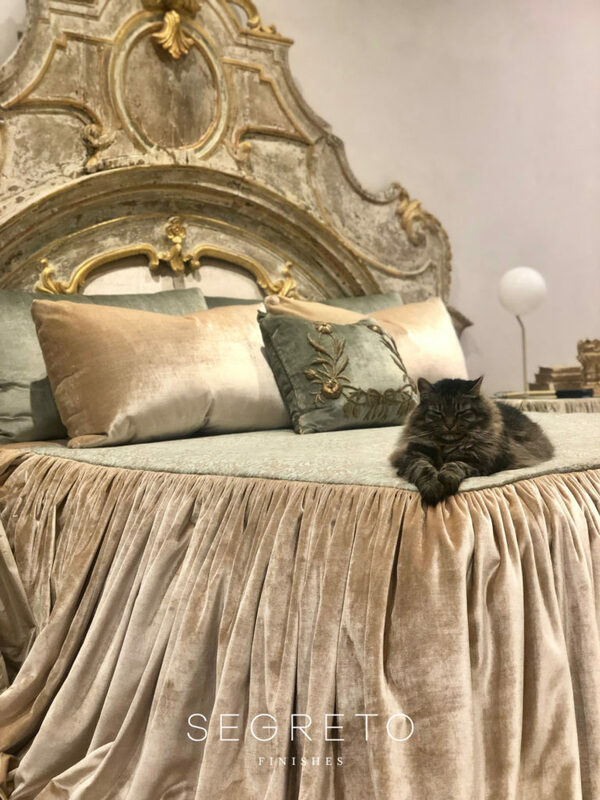 This little kitty stole the show on this elaborate bed, whose headboard is created from a Reclaimed French fragment found from Renouveau. I drove out to Hockley for a site visit on a job we are collaborating with Slovack-Bass. With steel framed windows and a plastered two story entry, this one will be beautiful when finished!! 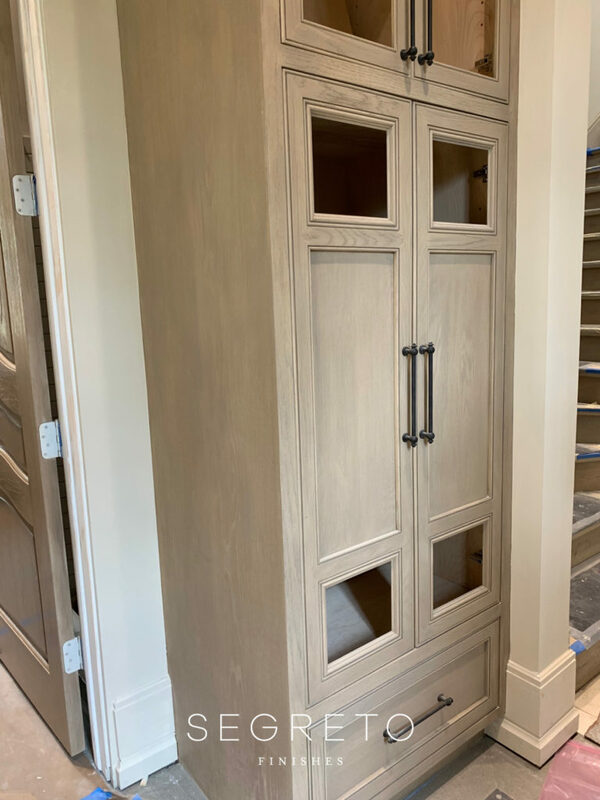 We are also staining much of the cabinetry and doors in the home! This natural tone is definitely a trend alert! Remember how oak used to be stained in orange tones!! I like this new direction so much better!! It allows the natural grain to show in such a quiet and warm way!! 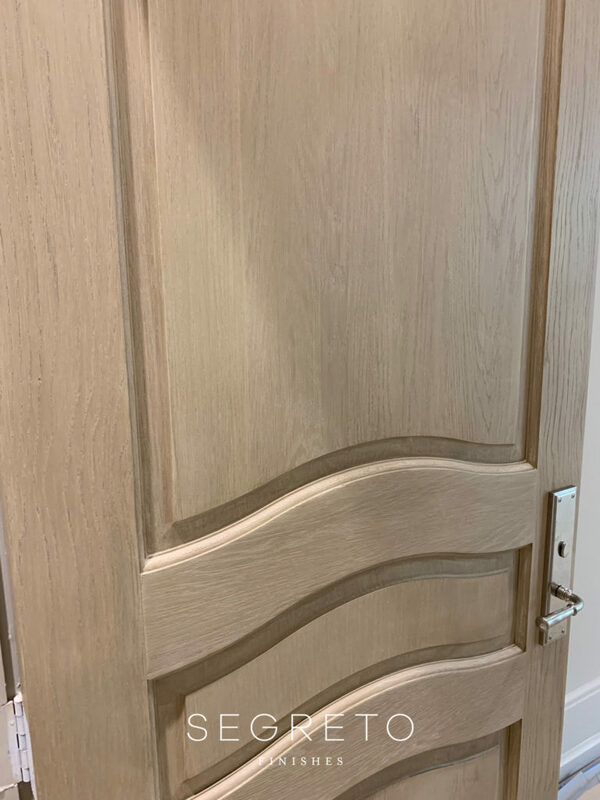 Here is a wooden door completely finished. So what is the difference in this door? It was a flat metal and we painted it to look like real wood! 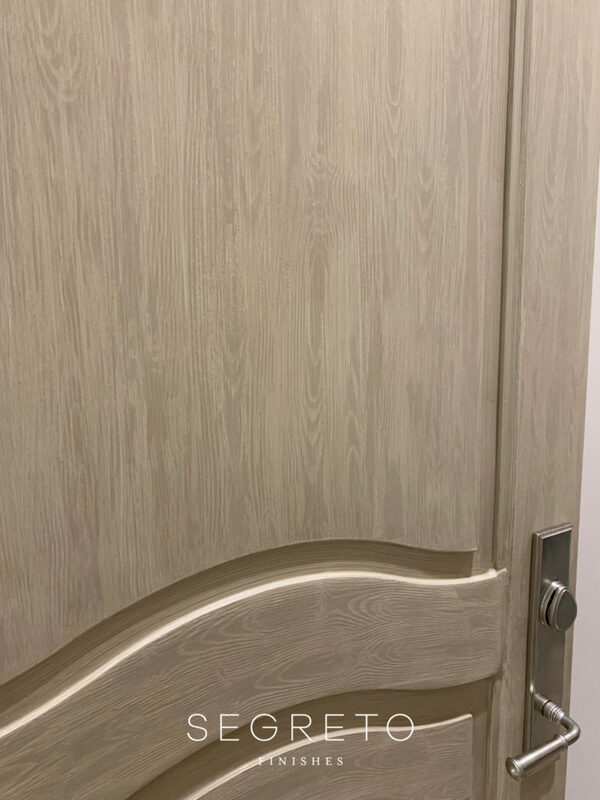 We used a wood grain tool to create the natural grain texture and painted and glazed it to match the other doors which we stained! The homeowner was so proud of it. 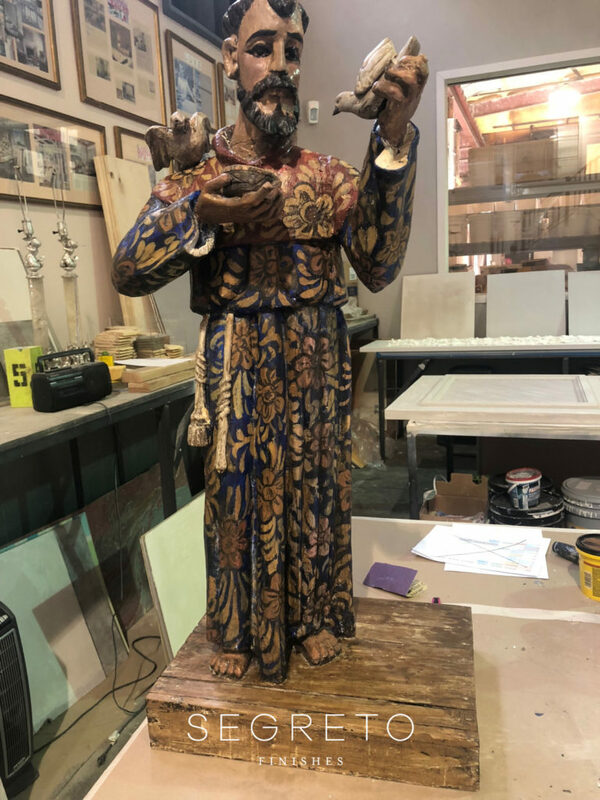 This job is being managed by Andrea, one of our designers and, on the walk though I had to be told which one was stained and which one was painted to look as if it started from the natural oak wood! I gave my guys a high five on this one!! Here is a sneak peak on book 4. 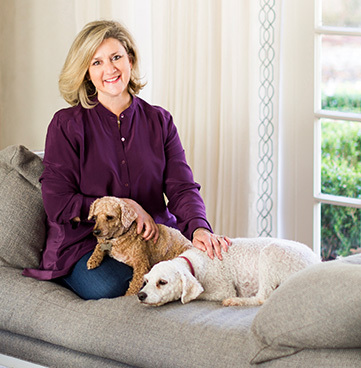 This home was a labor of love for Architectural Consultant, Sarah West. 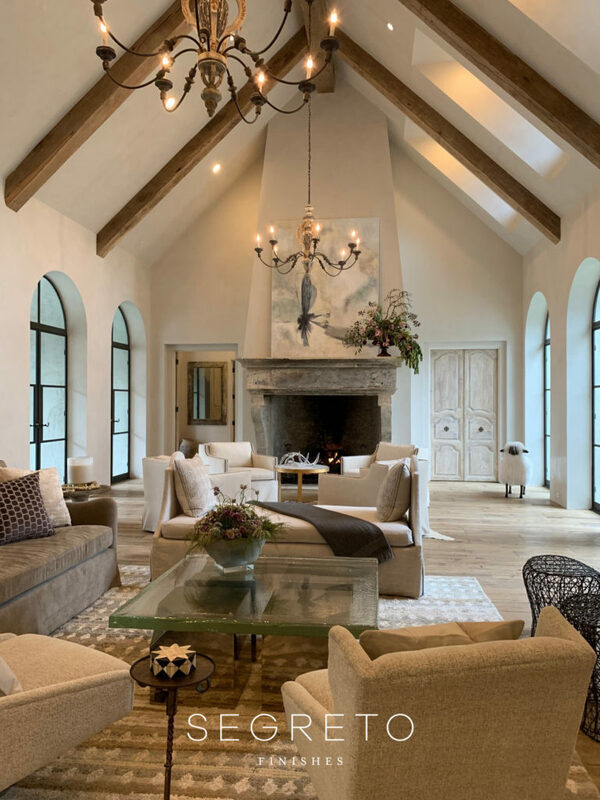 Typically working with designers to furnish the home, this project she took on from start to finish. 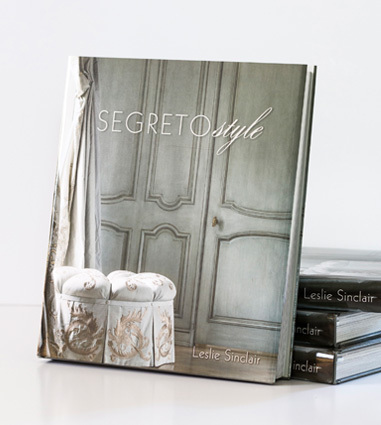 Loving to mix elements from all eras, she has created such an inviting space! Winding up the week, I went back to the warehouse to see what was happening there. 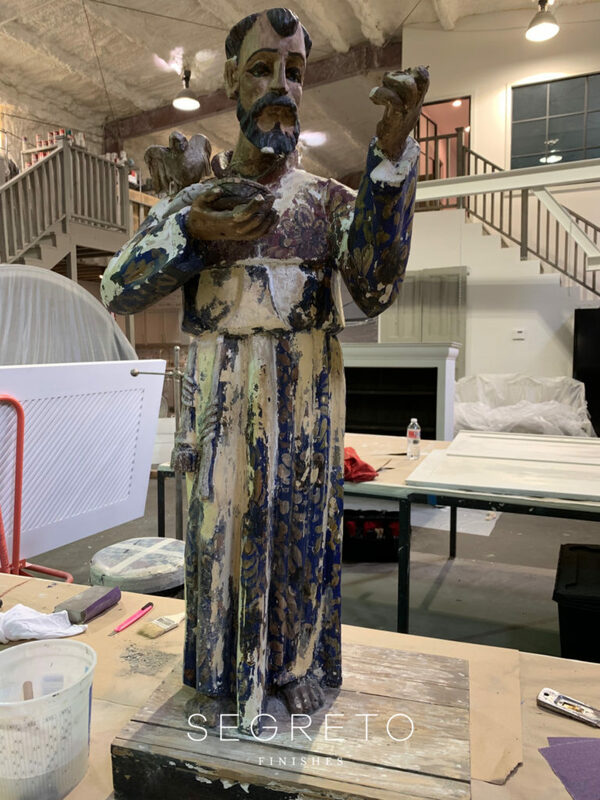 This statue which was damaged in Harvey is on the schedule to be restored. << Easter Tablescapes and DIY Easter Tree! Beautiful finishes Leslie! 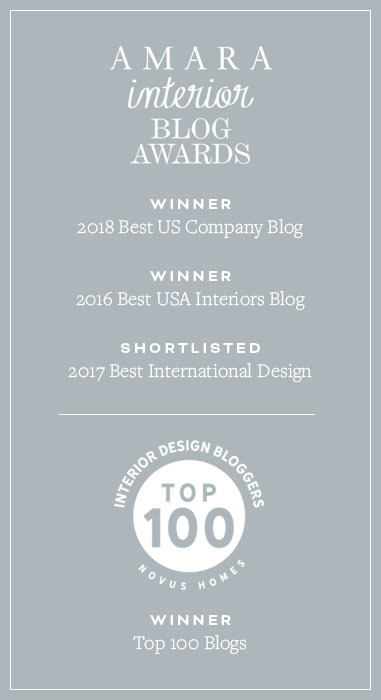 Always love working with your amazing team on my projects! Is the bedding custom made? Hi Belinda!! It was custom made. Its beautiful isn’t it!! I hope you have a wonderful week! Hi Leslie! When do you estimate your next book will be available? Hi Madelyn! You are so sweet–thank you!! I have a wonderful team! Have an amazing week! !